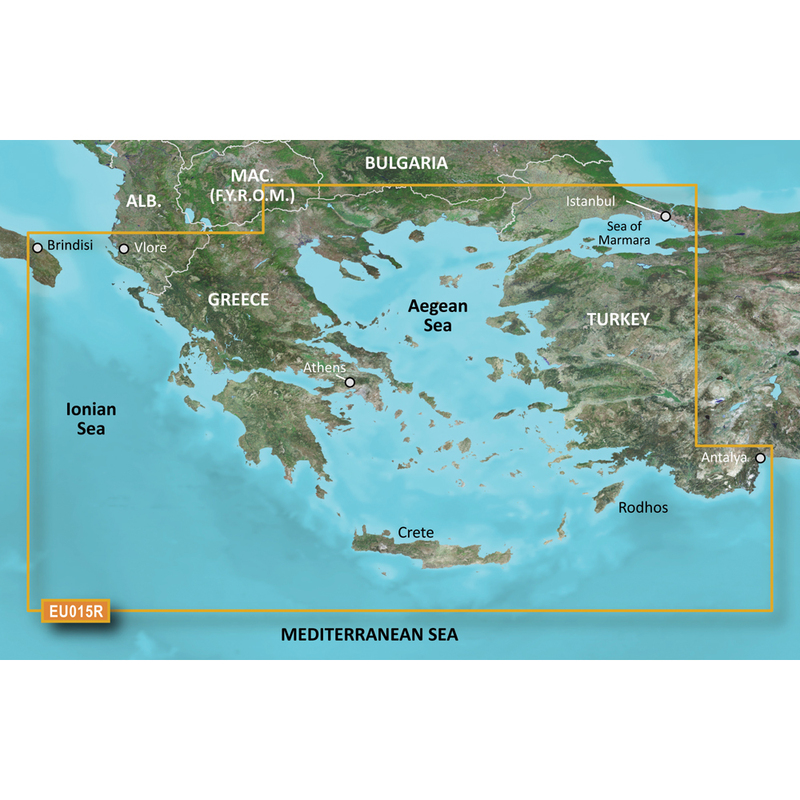 Including all of the Greek coast and Aegean Sea; Turkey from Istanbul and Sea of Marmara to Antalya; and Brindisi, Italy. Experience unparalleled coverage and brilliant detail when you’re on the water. BlueChart g3 Vision coastal charts provide industry-leading coverage, clarity and detail with integrated Garmin and Navionics content. Whether you are fishing or cruising, select a spot, and get a route showing you the general path and nearby obstructions at a safe depth1. This feature displays high-resolution Depth Range Shading for up to 10 depth ranges so you can view your designated target depth. To give a clear picture of shallow waters to avoid, this feature allows for shading at a user-defined depth. BlueChart g3 Vision charts feature 1’ contours that provide a more accurate depiction of bottom structure for improved fishing charts and enhanced detail in swamps, canals and port plans. High-resolution satellite imagery with navigational charts overlaid gives you a realistic view of your surroundings. It’s our most realistic charting display in a chartplotter — ideal for entering unfamiliar harbors or ports. This underwater perspective shows 3-D representation of bottom and contours as seen from below the waterline. Interface with sonar data for a customized view. This view provides a 3-D representation of the surrounding area both above and below the waterline. Crystal-clear aerial photography shows exceptional detail of many ports, harbors and marinas and is ideal when entering unfamiliar ports.